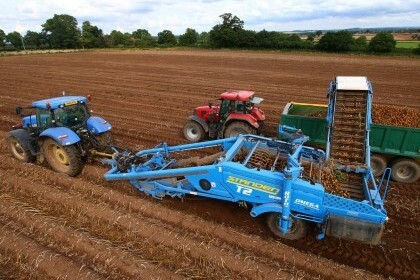 The Standen T3 Harvester is a tractor trailed 3-row potato harvester offering up to 60% more output than a 2-row trailed harvester. The T3 has a large digging area and sieving webs plus a huge capacity version of the OMEGA fluted roller separating system so it is well equipped to handle large output. Our best selling harvester offers the very latest technology for gentle lifting and greater output. The Standen T2 Potato Harvester is a highly manoeuvrable harvester built on a heavy duty tubular chassis designed to provide strength, superb driver visibility and easy maintenance access. Designed and engineered for high output due to thorough separation, cultivation and great manoeuvrability in the field. A powerful rotavator, which has been engineered for high performance and durability. Gentle, compact, effective separation comes as standard with the easy-to-operate Standen QM Harvester. It is a shorter, lighter harvester which offers excellent manoeuvrability and handling making it ideal for working in smaller fields. Designed purely for the harvesting of sweet potatoes the the Standen TSP 1900 Sweet Potato Harvester is a tractor trailed 2 row (36-44 inch rows) harvester featuring advanced harvesting technology.